Ooh, more minis! Minis are so cute. This time they're mattes. Just your standard colors, nothing exciting, but they might be a good choice for someone who wants to try mattes and doesn't want to commit to a full bottle of just one color. Here's the set. The first bottle is supposed to be a matte topcoat, mine accidentally got swapped for regular topcoat. Smoke and Mirrors, Alabaster, Dark Romance. Dark Romance. Matte black creme. This is a pure black, no shine, no shimmer. Well, okay, it has a little shine. Mine was more of a satiny finish than a matte. If you prefer a totally shine-free matte, you could always top it with some matte topcoat. Great coverage on this one, was opaque in one coat but I did two anyway.... Cause I'm like that. Smoke and Mirrors. Matte foil silver. A matte foily metallic, like a matte version of... say... Zoya Trixie? This reminds me a lot of Obsessive Compulsive Cosmetics Spanglemaker- a metallic silver that's neither sparkly nor shiny. Alabaster. Pure matte white. This is bright clean white, no undertones or hints of color to it. White-Out white. Unexpectedly smooth for a matte white. This has the most matte finish out of all of them. I wish I had a bottle of Color Club Matte Topcoat to show you, but my kit had a little mix up and I ended up with shiny instead of matte, like I mentioned above. 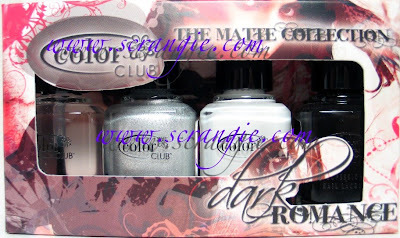 If I do get my hands on a bottle of Color Club Matte Topcoat, I'll definitely review it. I was waiting to get *all* of the matte topcoats until I did my comparison, but there's still a few I don't have, like this and the Barielle. The formula on these was good. I had no problems. They were smooth, didn't dry *too* fast while applying (mattes have a tendency to thicken while applying) and the end result was a matte nail that was completely smooth and dry in under 10 minutes. I love the mini bottles, I think they're adorable. The packaging is super cute. The colors aren't really unique or exciting, but I'd call this the Entry Level Matte Kit. It's a good way for a first-time matte user to test the waters. The mini bottle of matte topcoat makes this even more versatile. For less than the price of a bottle of OPI, you can try three matte shades and a matte topcoat. Or, if you're like me, you'll just take them out and admire them cause the little bottles are just too freakin' cute. I really like that set! I have one and the silver was my favorite, just because of the finish on it. I don't generally like mini's, but I love the size/shape of cc's, so much easier to work with. Dark Romance really sticks out ot me. What a cute collection! Oh, these are so PRETTY! Dark Romance looks like leather..nice! i really like the look of the "matte" black. its so smooth! I admit to playing with my minis. Smoke and Mirrors is lovely. I find the name captivating too. LOVE LOVE LOVE the silver foil- great work Scrangie!! Do you have any heads up on when the China Glaze Khrome collection is coming out? I am a fan of that look and just found it on the CG site. PS Love your blog, Scrangie, and yours, Mary! You folks are taking me from zero polish to about 80 bottles. It's like an addiction. Heck, it's not "like" an addiction. It's an addiction!!! I'm wearing Nichole's Virtuous Violet with a Cover Girl holo glitter over the top. Man, it's like crack for the eyeballs!!! I'm like Mary in that I usually don't like minis to use, but the Color Clubs are perfectly shaped and the brush is much nicer than most minis. This is the collection that had me swaying on the matte, I wasn't really interested before I saw this, but I quite like these! I have this set, and I love the silver, but I have to say, the white fought with me. But thanks for the Obsessive Compulsive compare - I was hoping to find something similar to Smoke and Mirrors to stock up on! Dark Romance is the one that is screaming out to me. It's like leather. Any idea where to find these little gems online? I didn't buy this set since I have enough blacks and whites. I can always use a matte topcoat. They look gorgeous on you. Makes me want to buy them. it seems like a lot of nail bloggers have had the top coat make their nails shinier...maybe there is no mix up, and the top coat is just like that? I love Smoke and Mirrors!